Is There an Age Limit for Laser Surgery? Why Can't I have Eye Surgery? Will I Need Glasses after Eye Surgery? Eye surgery has been used by eye specialists for many years to correct a range of eye conditions that for many reasons do not respond to medical intervention. This may be due to other underlying medical conditions such as diabetes or it may be due to a birth defect or one that has developed over time. 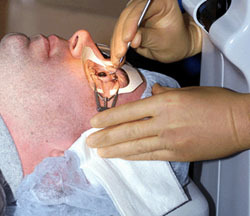 The question of the effectiveness of eye surgery is often raised. Its cost and the anxiety that some patients have of anything that involves the eye, makes the question a valid one that must be addressed. The effectiveness of the surgery is directly related to the reason it is being performed. Some surgery is intended to produce immediate improvement and in some cases complete recovery from vision impairment. Other surgery is purely cosmetic and intended to improve the look and self-confidence of the patient. The surgery may also be intended to partially correct a problem whilst also requiring on-going non-surgical treatment to produce a complete recovery and full vision improvement in the patient. Is Eye Surgery Effective as a Treatment for My Problem? If an ophthalmologist or other eye specialist suggests surgery as a means of improving your eye sight, it’s important to ask plenty of questions so that you fully understand the condition you have been diagnosed with and the potential problems associated with both treating the condition and not treating it. Deciding if the cost of a procedure is cost effective for the promised results of surgery is an important decision that must be made prior to surgery. If the surgery offers little more than cosmetic improvement to the face for example, the side effects of surgery if you have an underlying medical condition may not make the surgery a safe option for you. If no such pre-existing condition exists then you may consider the increase in self confidence that will arise from improving your vision or the appearance of your face and therefore the price may be worthwhile considering. Is Eye Surgery Effective Permanently? Many conditions respond initially to eye surgery, but offer no guarantee that the eye surgery will be permanently effective. Some conditions, such as strabismus or cross eye, may return in later years and require other surgery later in life. Surgery to correct such conditions as cataracts is complete and permanent. When choosing whether or not to undergo eye surgery, ensure that you are fully aware of the potential complications and long term success rates for the condition. It’s also important to remember that whilst some treatments (particularly those that are for cosmetic reasons, may appear to improve eyesight, there is need for an on-going consultation to ensure that the condition itself has improved and the patients eyesight has been improved by the surgery. The question “is eye surgery effective “is best answered by the consultant at the time of diagnosis and when potential treatments options are discussed with your doctor. In most cases if offered to you, the answer would be yes, the results of most types of eye surgery, whether it involves a laser or surgical procedure will produce the anticipated results for the patient.